I was recently approached with the possibility of joining the Rippin Lip Outdoors team. After looking through their site and talking with Bill Kohls I decided to accept the offer - so I am now part of Team Rippin Lip Outdoors. The team is all about promoting the outdoors in a positive manner, writing informative, review, and report style articles (much like my site), shooting videos, and getting people involved in the outdoors. Although parts of the site are still being updated, check it out for yourself here: Rippin Lip Outdoors! I will be spearheading the kayak fishing portion of the site, but will also contribute to other areas. Joining the team also gives me the opportunity to try a few new ideas I had that would have been difficult to do by myself. So, keep an eye out for some new things on my site and the Rippin Lip site. Until next time...tight lines! I got to spend a great day on Jordan Lake chasing crappie on Friday. I invited a few people, but because the trip was short notice they had other conflicts - so I adventured solo. Although not the best quality, I used my old Olympus to shoot some more video. So here it is - my 2nd video blog. If you have any feedback, suggestions, ideas, or requests please let me know! 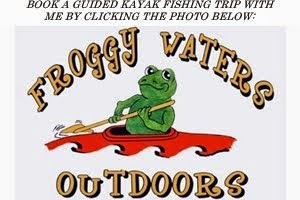 ***Please note that kayak fishing solo during cold weather months should be done as a last resort. I can't emphasize saftey enough. I had a dry pair of clothes, towel, and emergency blanket in my hull as well as a small survival kit and a fully charged cell phone (just in case). Plus I knew I would be out on a lake with numerous other boats around, as that particular area sees plenty of traffic this time of year. However, I try not to ever be on the water by myself this time of the year and you can never be too cautious - especially if you are in more remote locations.